Telephone: 0086-21-34661821, please note, the operator speaks Chinese only. Please make the phone call during 6:00 to 17:30 Beijing China time. 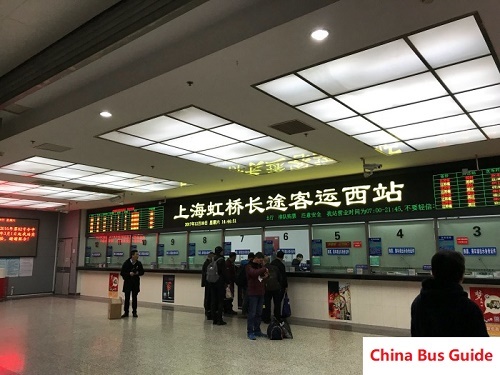 How to Get here: Shanghai West Long Distanace Bus Station borders Shanghai Hongqiao Railway Station and Shanghai Hongqiao International Airport terminal 2 to the east. Passengers who travel by Shanghai Metro Line 2 or Line 10 can alight at the metro station of Shanghai Hongqiao Railway Station. The bus station locates to C or D exit of the metro station. Service Review: Shanghai West Bus Station is well managed. It provides left luggage facilities, accessible elevators, maternal-infant waiting area, cell phone charging stations, information desk and etc to meet customers' special requirements. Have you ever traveled to Shanghai West Long Distance Bus Station? We encourage you to share your travel experience and review their service by leaving your comment here to help other visitors travel smartly. You can also leave a question here to get fast response.